This is not a low carb recipe, but it is so awesome I wanted to share it here anyway. For a long time I've wanted to make a vegan cheese that was similar in texture to Violife (Europe) or Chao (US). I've tried many times with different ingredients and methods and this steamed rice flour based cheese is the closest I've come. 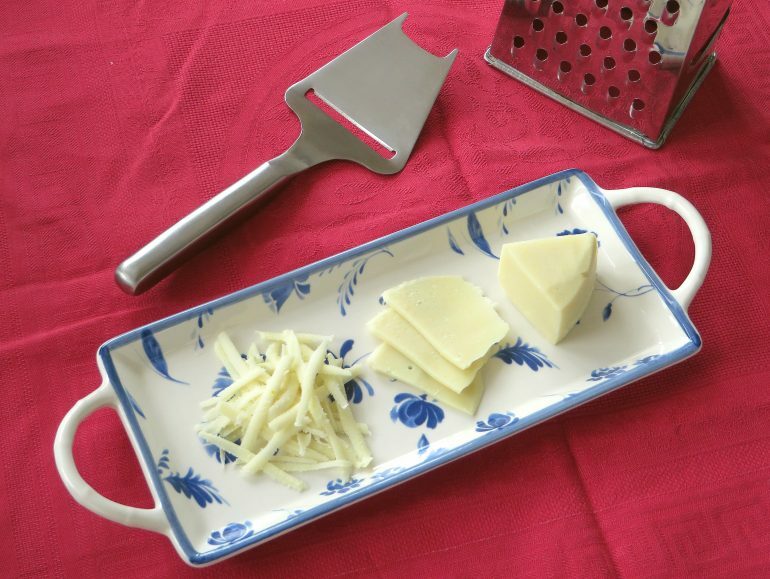 It has a lovely firm texture that allows it to be grated and sliced super thin. It's nice to eat cold, but also works well on grilled cheese and pizza, although it doesn't melt quite as well as the store bought variety. It's also soy free, gluten free, fodmap free and very cheap to make. A real game changer! The idea for this cheese came from an Indonesian dessert called kue lapis, where a mixture of rice flour and coconut milk is steamed to create a sticky cake. I accidentally made a slightly too dry version of it, and David said it would be a good texture for cheese, so I started experimenting! The flavors are super adaptable. In this recipe I keep it really simple, but you can add as many herbs, spices and flavorings as you want. I would really like to try it with lactic acid instead of vinegar and some commercially available vegan cheese flavors, but I'll have to order those online which I haven't gotten around to yet. Also try my other cheese recipes, like the super flavorful blue cheese and the lovely garlic herb cream cheese. Put all the ingredients in the jar of your blender or foodprocessor, and blend until it forma a completely smooth milky mixture, without lumps or visible oil droplets. Pour the cheese mixture into a glass or ceramic mold (I used a cereal bowl). Choose a mold that is plenty high enough to accommodate the liquid as it will bubble up during the steaming. Keep the water at a rolling boil and steam the cheese for about 45 minutes. After the steaming, the cheese will still be quite soft. Don't worry, it will firm up once it cools. If a thin layer of water dripped onto the cheese from the pot's lid, drain this off carefully. Let the cheese cool to room temperature and then cover it and put it into the fridge overnight to firm up. I was wondering if you could tell me more about the flavorings....I am enjoying your ideas and would love to learn more... If you are low carbing....you might want to watch the tofu for the goitergen problems...that causes weight gain and all the other issues as it messes with your thyroid. Just a thought. On the subject of tofu, research has shown that 2-3 servings of soy foods a day are actually beneficial for health (see for instance the paper by vegan dietitian Jack Norris on soy), so I am not worried about that at all. In my country is coconut oil expensive. Can I replace it? Hi Marcela, you preferably need an oil that is solid at room temperature. if you have access to vegan shortening or a firm vegan margerine, you could try using that. Neutral flavored cacao butter or palm oil would also work. Alas cheese flavors from that company cannot be sent to the USA! :-( This came up in my checkout page: Sorry, food items cannot be shipped to your country. Please remove this item before you confirm your order. That's too bad! Thanks for letting us know Bett. Really enjoying this cheese the texture is almost perfect could you add some cultures and age it or will the steaming kill of the bacteria? Glad you like it Anders! Steaming will kill the bacteria, so aging this cheese is a bit difficult. The flavor will improve if you let is rest in the fridge for a few days up to a week. I also had comments on facebook from someone who subbed part of the rice flour with tapioca en was able to blend the cheese after steaming before letting it cool and set. You could experiment with something like that and add cultures during the blending. I don't have nutritional yeast. Is there any reason for it in the recipe other than flavour? can i omit it or is it a must?? and are there any other substitutes for it?? Hi Dareen, you can omit the nutritional yeast if you want. It is just there for flavor. There are no real substitutes. If you have it around, you could add a little miso to the cheese for savoriness, but it isn't absolutely necessary. Hi, can you please clarify how you steam this cheeze? Do I understand correctly that you pour a mixture into a mold first and then put this mold into a steam pan with a lid?? Why not cooking the mixture straight away in a normal pot, stirring constantly and then pour into a mold to cool down? I'm confused... :( Cheers! Hi Pedro, you understand the process correctly. This cheese cannot be cooked in a pot. During cooking it becomes so firm that you cannot stir or pour it, so making it in a pot results in an unevenly cooked ugly cheese. Steaming it solves that problem, because the cheese can be cooked right in the mold. I hope this clears it up for you! Hi Crystal, happy to hear you like this cheese so much! You can substitute 1/3 cup of the rice flour with tapioca, which might help with the melting. People are also experimenting with adding up to a tablespoon carrageenan, which also seems to work. I only discovered your recipe today. Luckily had all the ingredients to whip up a batch. Have just substituted vinegar with apple cider vinegar. It is still hot of the stove, cooling now. Can't wait to taste it. Can I use it on pizza (vegan)? Hi Retha, this cheese doesn't melt very well, but people have used it on pizza with nice results. Just grate or slice it finely, and put it directly on the sauce, underneath the other toppings for best results. Hi! Can I use brown rice flour in place of white? Hi Taira, you can use brown rice flour, but the cheese will be more grainy and have a less convincing texture. I love this cheese. It's so easy to make, especially with an electric steamer. The texture is spot on. I'm very pleased except I used yellow mustard and now my cheese tastes like it. It's ok because I like mustard but not so much like cheese. I assume I used the wrong stuff. Can you be more specific about what "mild French mustard" means? Google showed me dijon when I used that search phrase but that seems stronger than yellow mustard. Thank you! Hi Melissa, glad you like it! Some people find the mustard flavor too strong. You can reduce the amount or leave it out entirely. I'm not sure about the different kinds of mustard. Here in Holland all the stores have 'French' mustard that is quite mild, but it might not be available in other countries. Martine, First of all, thank you for responding to all the comments. Not many bloggers do that. Secondly, you have such a knowledge of all the different ingredients people have asked you about. Seems like you have experimented with these ingredients and/or, you have been a vegan for a while, and you know all about the different ingredients. I think I miss cheese the most. The two I miss the most are Swiss and Parmesan, because I like the tang they both have. Do you have a YouTube channel we can subscribe to, or do you only blog here, and on the Facebook page? I would like to make this for my daughter who is allergic to dairy (and 20 other foods) but I do not have a rice steamer. Do you think it would work in either a bain-marie, or something similar to a double boiler (I dont have that but can submerge a mixing bowl into a pan of boiling water)? Hi Veronica, I think your best option is to improvise a steamer with a regular pot and a colander, or by putting an inverted plate or bowl at the bottom of the pot, and then putting the cheese mold on top of that. Anything that will lift the cheese above the level of water at the bottom of the pot. A double boiler or au-bain-marie probably won't be hot enough, you really need the heat from the steam on all sides of the cheese. This is wonderful. I made it yesterday afternoon (used a Vitamix and small double boiler). I couldn't wait until this afternoon to taste it; tasted it this morning. It is awesome. Thank you so much for a great recipe that I will make often. Perhaps a silly question....But do you use raw or cooked rice? I cannot wait to make This cheese!! Hi Jokuh, this recipe uses rice flour, which is raw. Can I use potato flour or a wheat flour such as cake flour? Hi ransomed, different flours give very different textures. I recommend you use the specific type of rice flour for which I designed this recipe. If you use another type of flour, you will have to experiment with the amount of liquid to add, and you will probably not get the same texture as the original recipe. Thanks! I'll have to buy some rice flour to see how it's supposed to be. Then, if I like the original, I'll experiment with wheat flour and potato flour and let you know how it goes. I read all the comment's and tell only thing is how to steam the rice flour. Can I use an instant pot to steam it. Or put ramakins In a large pot with water and be heightened a bit with a trinket because I don't have a double boiler or a steamer. Can I make rice flour by crushing raw rice in the grinder or should use store bought? How fine should the flour be? Hi Paayel, the rice flour should be very fine to get a nice firm texture. You may need to tweak the recipe to get a good result with home-ground flour. is the oil necessary or can it be omitted? Hi toni, the texture and flavor will be a lot less cheese-like without the oil. You would also have to experiment with the amount of water that has to be added to replace the oil. I do not recommend it. Hi Heddy, that's great! I am very happy to hear you like my recipe so much. Hi Linda, a double boiler does not really provide enough heat to steam the cheese properly. Please see the other comments for tips on improvised steaming solutions. Amazing! I did 3 times now and I love it! Each time I made it with different flavors. Thank you for the recipe. Hi Soconina, that's great to hear! Glad you like it so much. Hi. Do you think this ca. Be steamed in an Instant Pot? I was thinking of putting a cup of water in the liner and putting a 1 qt casserole in with the mix and steaming for 15 minutes with a 10 minute natural release. Do you think this would work? Hi Deborah, I think that would work yes! You may have to experiment with the timing a bit. There is a Filipino sweet cake recipe called Palitaw which uses rice flour as well. I accidentally stuffed up the mixture one day and kneaded the dough too much that it turned into a hard sweet cake, but the texture was so much like cheese that I revised it adding mashed fermented tofu as a savoury ingredient. I ended up with a hard vegan cheese I can grate! With Palitaw you don't need a steamer. You actually drop the small round dough into boiling water till it floats! Then you spoon them out and let it harden in the fridge. I usually dust it with extra rice flour to absorb excess oil. That's really interesting Jesse! I'll look up a recipe for Palitaw. I made it with blender-grinded rice... It is like cous-cous casserole. :D So really fine rice flour is really necessary. The cheese is sliceable even though like "cous cous casserole" at first. And the taste is very good. It tastes like cheese! I have been eating the first block for over a week and the taste gets better with time. I definitely will make it again and again. I am very happy for this simple cheese recipe. I replaced coconut oil with self-made vegan butter, because it tastes like butter, not coconut. I don't like coconut oil taste. I also replaced vinegar with lemon juice as it is healthier. I think it worked well. :) Thank You so much for sharing this recipe! Glad it worked out in the end Silvya! If you use refined coconut oil, the cheese will not have any coconut taste, but of course using your own vegan butter is also fine. Hi Miri, that's weird! I've never had anything like that happen. Maybe the batter got hot in the blender, so it started to congeal? Next time blend is just until smooth. I hope the cheese still tasted good. When you say rice steamer are you referring to a rice cooker I have one. With a steam basket. Hi Janice, yes you can use your rice cooker with the steam basket, or any other type of steaming pot. I loved your recipe! I only have one question related to the texture, it was difficult to take it from the glass/ceramic mold without breaking it (maybe silicon? or a sous-vide? ), it's not very elastic. Do you think a little bit of tapioca flour, chia seeds or something like that would solve this? Besides, instead of coconut oil (couldn't find a neutral one in here) i used sunflower seed oil. Thanks a lot! Hi Juno, I'm happy you like the recipe! If you use sunflower oil instead of coconut, the cheese will be less firm and more difficult to release from the mold. A silicon mold could help here. Tapioca may make the cheese a bit more elastic. Generally, I wait untill the cheese has firmed up completely and then loosen the edges with a table knife and then use the knife as a lever to whip the cheese out of the mold. That als works perfectly for me, but I don't know if it works for cheese that was made without coconut oil. This came out DELICIOUS! Wow! Thank you. I did put a little too much turmeric, hence the yellow color. I added to your recipe 1/2 teaspoonful of onion powder. I did not have the mustard you used, I substituted with yellow mustard. So, so tasty! My texture was a little grainy. Next time I will grease the bowl or add plastic wrap to the bowl, to get the cheese out more easily. I have to cut it inside the bowl, otherwise it will come apart, sticking. Very yummy!!! Thank you!! Happy you liked it so much Newbie! For me it comes out of the bowl perfectly if I just let it firm up completely and then loosen the edges, but greasing or plastic wrap will probably work too. I tried a slight variation of your delicious rice cheese recipe last night, and couldn't wait to taste it this morning. So good! I tried a slice and then grated it on top of a seitan/bean/garlic sausage pizza... did not melt, but worked just fine anyway. I made a variation with sun dried tomatoes and garlic, with miso and sauerkraut juice replacing the lemon and vinegar. The basic white version is a perfect place to start experimenting from. Thanks so much! Sounds lovely Kim, thanks for sharing! I am confused about the measurement of the rice flour called for in the recipe. Is it 1 cup? I've gathered all the ingredients and I'm almost ready to get it a try. But first, I have a question about steaming the recipe in an Instant Pot. Is the timing the same for using the Instant Pot steaming function? Hi Nita, I do not have an instant pot, but I thing the timing would be the same, as long as it has a regular steaming function and you are not cooking under pressure. Thank you for this great recipe! Even though my cheap bullet type blender didn't blend it completely as it was quite thick, it still came out a perfect texture. I made this in Instant Pot on low pressure, for 30 min. letting pressure release on it's own. I used a 4 cup glass pyrex, it came out easily after chilled. I used 1/3 cup tapioca starch, 2/3 cup rice flour. I also added miso, 2 teas lemon and 1 of white balsamic, smoked salt, and a little more nooch. I'll be making this often playing with different flavors. Next time fresh chives and roasted garlic. Then jalepanos and dried tomato. Such a good cheese to have with fruit! Mine softens when heated, which is better than most vegan cheese that just dissolve into stickiness! Thank you for sharing you recipe tweaks Denise! That's lovely Purbali, enjoy your cheese! Hi again, I've accidentally bought glutinous rice flour - will it be a disaster? Hi Lesley, that's too bad! The texture will be very different if you use glutinous rice flour. I do not recommend it. That's great Bob, glad you like it! Can you place the cheese in a steamer insert over boiling water or does it need to be immersed in water? Hi Teresa, the cheese should ideally be suspended above the water, not immersed. So yes, a steamer insert is great to use! First of all - thank you so much. I've been vegan for 12 years and this is hands-down the best homemade cheese I've ever made. This is a life changing find. Mine firmed up right away - I used my instant pot on the steam function for 45 minutes with the valve sealed, so maybe that's why. It tasted very much like the vacuum packed dry mozzarella cheese my mom bought when I was a kid. I planned to wait until tomorrow, but uhhhhhhhhh. Instead I immediately made air-fried mozzarella sticks and they were incredible. Hi Patrick, I'm really happy that you like this recipe so much. Enjoy experimenting with it! Hi Martine, I’m just making the cheese right now but I have a question about the rice flour quantity, I weighed the flour and 1/2 cup gave me 157g, so I left it like that because I thought that 1 cup would give me way too much flour, what do you think? Hi Veronique, yes 157 grams is already too much. Unfortunately, cup measurements will always be less accurate than weight. This is why the recipe says 'spooned and leveled'. This is a specific technique for filling the cup. If you fill the cup by scooping from the bag, you will end up with much more flour packed into the cup, than if you fill the cup one spoonful at a time. Hi Max, the cheese flavors are available from this French webshop: https://www.meilleurduchef.com/fr/rech?kw=arome+fromage I do not know any other place that ships them internationally. What is the shelf life of the cheese? Do I need to keep it refrigerated? Hi Ana, this cheese keeps about two weeks and needs to be stored in the fridge. Recently, people have experimented with keeping it in a salty wine brine. That extends the shelf life up to two months and makes it even more firm and crumbly. I just wanted to make sure this cheese is actually firm and has that texture of like Chao cheese? I have had issues with all my cheese textures but my flavors are spot on. If I can combine the two it would be so perfect. Hi Kim, this cheese really comes out firm, much firmer than agar or carrageenan based cheeses. Cold, it has a texture like Chao cheese, a bit more firm and crumbly even, depending on how much liquid you use. It does not melt like Chao cheese though, so it is best enjoyed cold or as a fried cheese stick. Hi Martine, when steaming the cheese should it be covered with cling wrap? Hi Shelley, you do not need to cover the cheese. Sometimes a small amount of water drips down onto the cheese during steaming and I just pour it off when the cheese is done. Hi Martine, thank you for a brilliant recipe. I have tried many store bought vegan cheeses and made many at home, but this recipe is definitely the best I have had. It is perfect sliced on wholemeal grain toast for breakfast. Just what I was looking for! Thanks Justine, glad you like it! I'm unfamiliar with mild French mustard. I assume that it's not the French's yellow mustard. Do you have a link to the brand you used. Hopefully, it'll be something I can get from Amazon or at Whole Foods! Hi Tonia, as I mentioned to another comment above, any mild yellow mustard will do. Apparently, the mild French mustard we have in my country is not available abroad. I have made this recipe numerous times but i was hoping you could suggest some flavorings. We love it the way you have it listed here but i would love to jazz i up. I also use coconut milk instead of water( not canned or sweetened ) and it makes the cheese creamier. Hi Vicki, I've seen people add miso, whole cumin seeds or fenugreek seeds, dill, garlic, Italian herbs, pureed cashews (for creaminess), tomato puree, pureed roasted peppers and other stuff. The sky is the limit! You can age the cheese in wine or in a salty herb broth, to get a feta-like cheese. You could also order vegan cheese aroma from France (see link in the comments above). In the Facebook group Vegan Cheese - hits&misses, people have shared countless variations. Have fun! This recipe is the easiest vegan cheese I’ve made (and I’ve tried a lot of them). Absolutely fabulous. I steamed mine using my Instant Pot steam function. Someone online suggested doing more than the 45 minute steam, up to 80 minutes with natural pressure release. It was perfect and, in the 4 hours it has been in the refrigerator, it has really firmed up. Thanks so much. I’m going to make it again with chopped olives and dried tomatoes. This cheese is wow, amazing and very playful. Thank you for sharing it! Hi Den, sorry for the late reply. I do mean a normal steamer. The cheese is more or less solid after steaming, so you can hold the bowl upside down to drain off any excess water. The boiled water is just for the steamer. The water listed with the ingredients, should be added into the blender, cold not boiled.